A student of Jolene Eastman-Spang finishes her Crow Doll. Eastman-Spang, a traditional Crow Indian doll maker, will demonstrate her craft in the Native American Center, Room 305 on the third floor of the Student Center, from 11 a.m. to 2 p.m. on Friday, Nov. 2 during Minot State University's Native American Cultural Celebration. MINOT, N.D. – Minot State University’s Native American Center will host Jolene Eastman-Spang, traditional Crow Indian doll maker, during their Native American Cultural Celebration. Eastman-Spang, who was taught by her mother Evelyn Hogan Bear Ground, will demonstrate her craft in the Native American Center, Room 305 on the third floor of the Student Center, from 11 a.m. to 2 p.m. on Friday, Nov. 2. Dolls play an important role in Native American and world culture, with nearly every tribe in the world having created their own dolls using different materials and techniques to reflect their tribal traditions and history. The Crow people are no different. 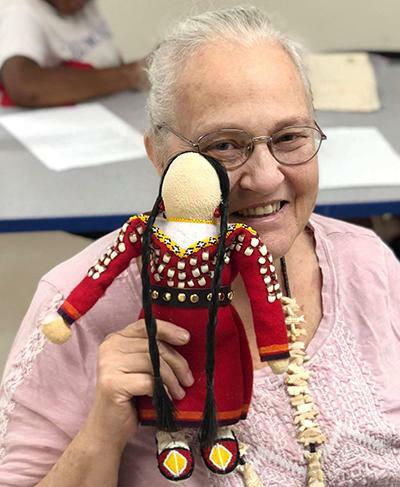 “For generation after generation, mothers, aunties, and grandmothers of the Crow Tribe have made dolls for their daughters, grandchildren, and relatives. I learned the art of doll making from my mother, Mary Ann Reed Hogan, and, through continuing my journey in that traditional craft, have realized that dolls continue to bring enjoyment, care, and love to life and families. The ‘no-face’ dolls also encourage the imagination and dreams of children,” said Hogan Bear Ground. Eastman-Spang is the great-great-granddaughter of famed Crow medicine woman Pretty-Shield, one of the first Native American women to have her story written and recorded. In addition to meeting and watching Eastman-Spang on Nov. 2, the Native American Center is hosting an open house on Thursday, Nov. 1 from 11 a.m. to 2 p.m. for students and community members to learn about the resources and services they offer. Food will be served during Thursday’s event. For more information about Crow Indian doll making and Eastman-Spang, contact Evelyn Klimpel at evelyn.klimpel@MinotStateU.edu. To find out additional information about the Native American Cultural Celebration, contact Annette Mennem, Native American Center director and Diversity Council co-chairperson, at annette.mennem@MinotStateU.edu.